Without new products from the U.S. Mint to excite buying, unit sales retreated for the most part. Exceptions included American Eagles, new and old. Compared to its previous 21,592 weekly increase, the 2013-W Proof Silver Eagle advanced 23,506 during its second full week of sales. With that gain, it hurdled the 300,000 level and reclaimed the Mint’s top-selling spot — a place it had lost after White Mountain quarters debuted. As discussed earlier this week, 2012-W Proof Gold Eagles are gone. The four-coin set was the last Gold Eagle product available before selling out. Its number increased 330 versus the prior 229 for a total of 8,957. The gain was low enough whereas each of the four-sized 2012 Proof Gold Eagles end with the scarcest mintages of all-time. 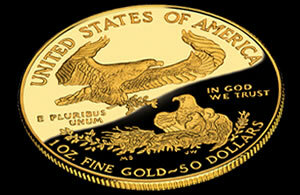 This year’s 2013 Proof Gold Eagles are scheduled to debut in April. Currently, the only other numismatic gold coins offered by the U.S. Mint are last year’s eight First Spouse Gold Coins. Their weekly sales as a group advanced 254 versus 113 previously. Finally, sales ended on Jan. 28 for the 2012 Mint Set. The U.S. Mint has stopped adding to its total so its unaudited final sales figure is 392,224. That is the lowest since the uncirculated Mint Set from 1962. The following grid provides the latest weekly and January sales for all U.S. Mint bullion products. The weekly period covers sales from Feb. 7 to Feb. 13, 2013. *American Eagle and American Buffalo total sales are only for calendar year 2013. The 5 oz. totals are for the coins sold by design and are all-time sales. Several of these, as shown, have seen some negative adjustments lately. For more information or to buy any of the above products, visit the U.S. Mint website at http://catalog.usmint.gov/.